GOD BLESS THE BROKEN ROAD tells a profound, poignant story of a war widow named Amanda who gets angry at God, loses her faith, and is brought to her knees to restore her life. The movie is very clean and evangelical, with brief war violence and deep, insightful discussions about why bad things happen to good people. 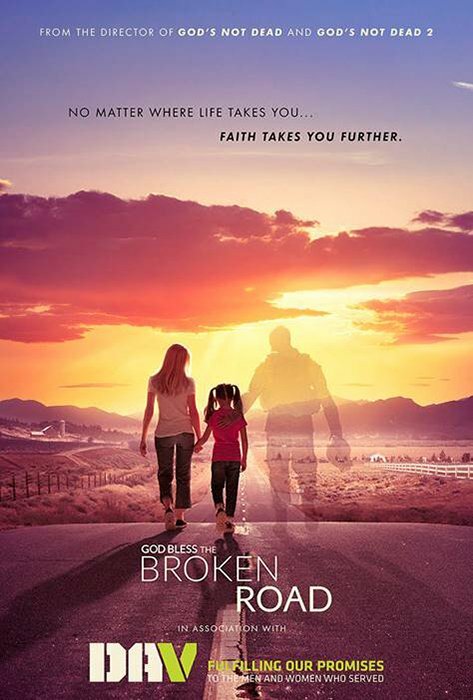 GOD BLESS THE BROKEN ROAD tells a profound, poignant story of a war widow named Amanda who gets angry at God, loses her faith and is brought to her knees to restore her life. The movie is very clean and evangelical, with brief war violence and deep, insightful discussions about why bad things happen to good people. The movie opens with a scouting party of American 101st Airborne soldiers in Afghanistan treating their expedition with humor and grace. Cut to Amanda leading the church choir. She is a picture-perfect wife and mother with a beautiful voice. Then, two soldiers walk in to tell Amanda her husband, Darren, has just died in combat. She collapses. Cut to Amanda sometime later not wanting to get up to go to church, but her daughter, Brie, wants to go to Sunday School. She drives Brie to church. Then, a professional race car driver named Cody, who’s been sent to train under Joe, a racing expert who runs an auto repair shop in disrepair, sees Amanda in the church parking lot and is impressed. Cody is full of himself and unwilling to learn how to drive his race car properly so he can finally win a race. Amanda wants no part of anybody, including Cody. She’s running out of time and money. Amanda starts working longer hours as a waitress. She gets a loan from a disreputable pawnbroker because the bank is heartless and wants to foreclose on her mortgage. Amanda’s mother-in-law wants to take care of Brie and thinks Amanda’s doing a bad job raising Brie. All Amanda has left from Darren is the house and her ring, and she pawns the ring and loses the house. How can Amanda see God’s love in the midst of all these trials and tribulations? How can she be reconciled with Patty, her mother-in-law, and Brie? How can Cody turn into the man he should be, not only to win races but also to win Amanda? GOD BLESS THE BROKEN ROAD is very well crafted, with good direction and fine acting from a cast that’s not well known. The story is heartrending and poignant, with great orchestration of some lighter moments that keep it from becoming maudlin. It’s a testimony to the price that everyone needs to pay to defend our freedoms, not just the soldiers but also the families. It is also a great expose and refutation of bad theology that helps viewers realize the depth and breadth of God’s love in the midst of trials and tribulations. MOVIEGUIDE® advises a slight caution for younger children and people who are sensitive to psychological pain. That’s because of the death of the father in the movie, the spiraling out of control of the mother, the potential for self-destruction, and some other serious themes. Anger toward God, girl is angry toward her mother, daughter runs away from home, fighting between woman and her widowed daughter-in-law, disreputable pawnbroker, callous banker, foolhardy race car driver. GOD BLESS THE BROKEN ROAD tells a profound, poignant story. Amanda is a picture-perfect wife and mother. She has a beautiful voice and sings in the church choir. When her husband is killed in Afghanistan, Amanda doesn’t want to do anything, not even go to church. All Amanda has left is the house and her ring, and she pawns the ring and loses the house. How can Amanda see God’s love in the midst of all these trials and tribulations? How can she be reconciled with her daughter and mother-in-law? GOD BLESS THE BROKEN ROAD is very well crafted, with good direction and fine acting. The story is heartrending and poignant, with great orchestration of some lighter moments that keep from being maudlin. It’s a testimony to the price everyone needs to pay to defend our freedoms, not just the soldiers but also the families. It’s also a great refutation of bad theology that helps viewers realize the depth of God’s love in the midst of trials and tribulations. MOVIEGUIDE® advises slight caution for people who are sensitive to psychological pain.